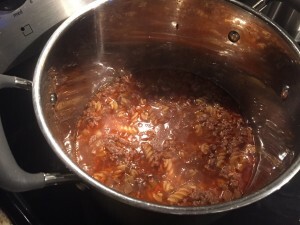 Playing catch-up on the blogging, but here’s recipe #4 of the year – One Pot Beef Stroganoff. I picked up this recipe on Pinterest, but here’s the direct link to the original post. 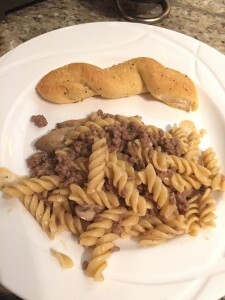 So far, I have to say, this is one of my favorite (and Josh’s favorite) recipes. It’s quick(ish) and easy. Plus, it’s only one pot that gets dirty (which J loves). This recipe makes quite a bit, so you’ll definitely have enough for a larger audience, or enough for leftovers throughout the week. I got all of the ingredients together – and dug in. 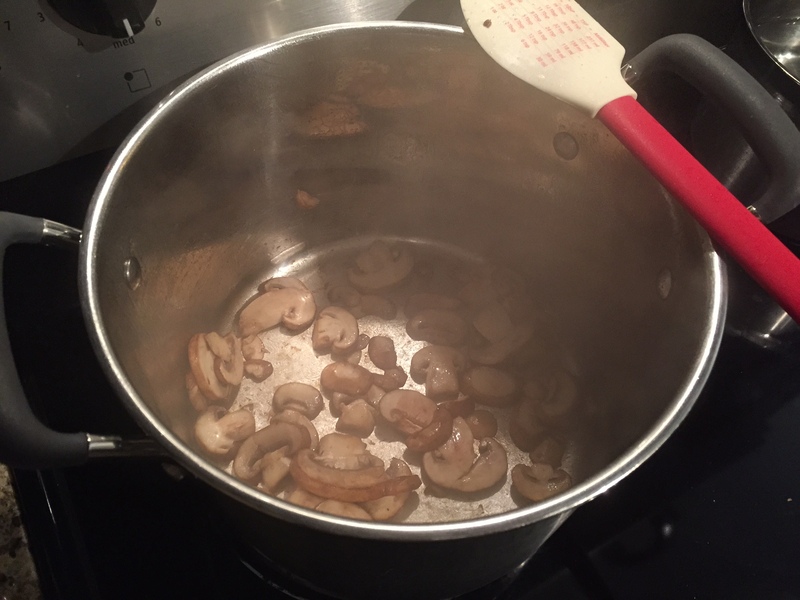 I started cooking the mushrooms in the olive oil. Originally recipe said 5 minutes, however, I found that it took a bit longer due to the thickness of my mushrooms. Once the mushrooms were ready, I put them in a bowl and stuck them in the microwave to keep them warm. Next up came the onions. The recipe called for onions, but since I *hate* chopping fresh onions, I used frozen. 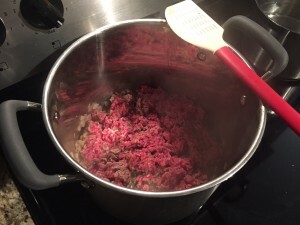 Then the beef gets added for browning. Once the beef is done, sprinkle with paprika, add the beef broth and dry pasta, bring to a light boil, and cover for 17-20 minutes until the pasta is ready. Let’s get ready to boil! 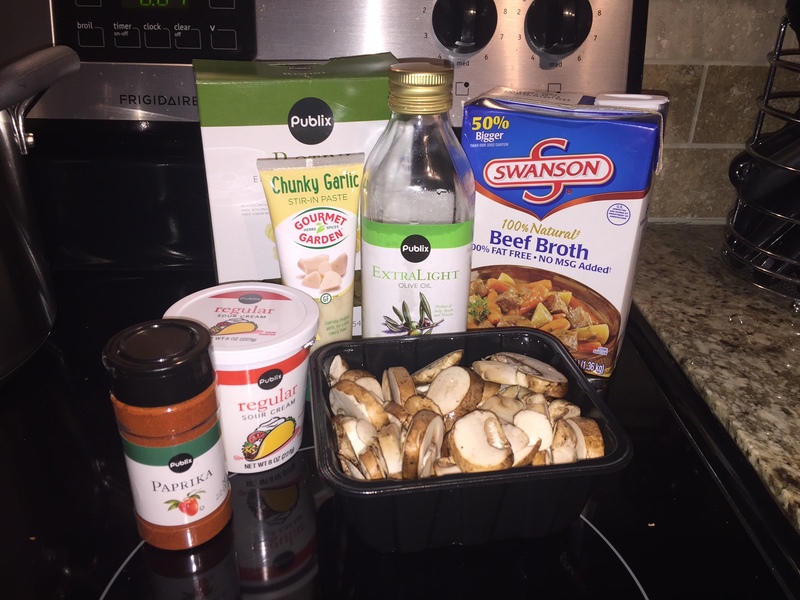 After the pasta is al dente, add the mushrooms and the sour cream, stir and serve! Definitely an easy recipe to knock out. Very hearty and filling, can pair with a salad or your choice of veggies. A winner in our house for sure! Amy – 4.5 out of 5 stars. Yummy and easy. It’ll be a staple during the winter months.